Too many adults act like bratty kids when it comes to vegetables. Stop whining and eat your vegetables!! Obviously, we're here to discuss vegetables. One reason is that when people meet us, they assume we eat a lot of fruit and vegetables because we're lean and fit. And for some reason they think we never eat stuff like burgers and pizza. But does this equation hold up? The truth is, we do eat a lot of vegetables, but that's not the main reason we're able to stay lean. A typical assumption is that eating healthy foods equates to losing weight and getting lean. Unfortunately, more "healthy foods" does not equal more weight loss. However, we will explain how you do lose weight and what role vegetables should play in your nutrition regimen. First off, let's set the record straight, you don't lose weight by eating more healthy foods. You lose weight by eating the right amount of food for your body. We're talking about calories and macronutrients. In general, vegetables don't have a lot of calories. So, when you're thinking about incorporating them into your regular diet, you can eat a lot of vegetables and still not consume too many calories. This is great because you'll get your fill of micronutrients (vitamins and minerals) without surpassing your calorie goal for the day. Now, keep in mind that vegetables are generally low in macronutrients (fat, protein, carbohydrates), and serve a specific purpose in your diet. The reason for eating fruits, vegetables, and other high-quality whole foods on a regular basis are the micronutrients mentioned above. Let's use broccoli as an example. Well, if you put enough sauce or cheese on it, everyone loves broccoli. Broccoli is really high in micronutrients, specifically in Vitamin K which is known to contribute to bone density and strength, as well as heart health. Also, broccoli is high in Vitamin C (look out, oranges!) which is important for a healthy immune system. We can look at all different kinds of vegetables and break them down one by one, and learn that each one serves a different purpose, delivering vital micronutrients for daily body function. Does this mean you have to eat all the vegetables every day? But that's why it's important to consume about 70% whole foods in your diet. Over the span of a week or so, you're eating a good amount of vegetables and you don't have to worry about avoiding foods you enjoy (like pizza). 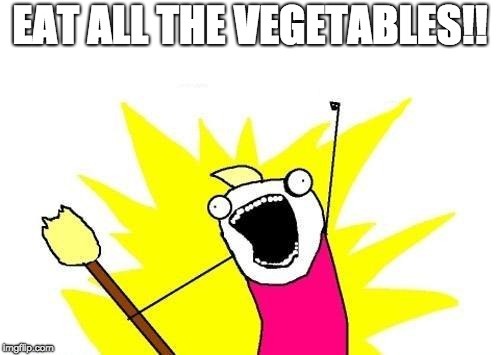 What does it look like on an average day to include vegetables in your diet? We recommend about 5 servings of vegetables a day. Now, this doesn't have to be 5 different servings or 5 entirely different vegetables. You can just eat a huge portion of broccoli or a large salad. This level of vegetable consumption will help you maintain healthy body function. If you miss a day, don't worry about it. You can spread this out over the course of a week. Let's say you're traveling and you can't get your regular amount of vegetables, you can take a supplement like Athletic Greens. We don't talk a lot about Athletic Greens, but we use it often and are confident in recommending it to you. It's not a vegetable "substitute", but rather a "supplement" because it complements a balanced diet. Throwing a scoop of this in the mix will help you ensure your bases are covered when it comes to micronutrients. REMEMBER: Supplements are NOT a substitute for real, whole foods.